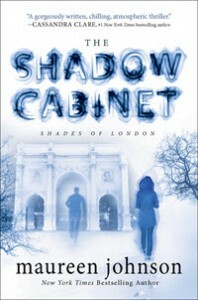 kt literary » Blog Archive » Happy Book Birthday to THE SHADOW CABINET! Happy Book Birthday to THE SHADOW CABINET! Rory’s London is one where death is but tenuously separated from life, and she must use her abilities to save not only her own friends, but now the city at large. This deftly plotted and richly developed third installment skillfully weaves together the plotlines from its predecessors, creating a carefully and engrossingly built world. Moving away from what could have easily been a predictable, cookie-cutter ghost-busting template in every book, the series has gracefully evolved into a heady mix of ghost story, myth, conspiracies and history. Thanks also to Kirkus for calling TSC a Top Teen Title of the Month!